(09-06-2018, 09:20 AM)SirWhiskers Wrote: Yeah, it's not the same as Muhle STF v2. Plisson has a thicker fiber than Muhle and also thicker than the previous gen Plisson synth. When it comes to density, Plisson should have used a bit more fiber. These knots cannot afford to lose a single fiber The fiber however has good backbone (due to its thickness) and there's no glue bump. To me the fiber is more like a 2-band badger than a fine hair Silvertip. I wonder where Plisson sources this new fiber from as I haven't seen it in other brushes. Thank you so much for sharing your experience with us.I was wondering about these new synthetic brushes since I only use synthetic these days.They price seems to high but theyre soooo good looking , I must admit. May I ask whats your favorite synthetic brush now ? (09-07-2018, 01:30 PM)Teiste Wrote: Thank you so much for sharing your experience with us.I was wondering about these new synthetic brushes since I only use synthetic these days.They price seems to high but theyre soooo good looking , I must admit. Still looking, evaluating and trying different knots and fibers ... just started with synthetics a couple of months ago after many years of badgers only. Muhle STF v2 fiber seems pretty nice. Plissoft type fibers (in various colors) seem to feel a bit prickly on my face and sometimes leave me with a bit of an itchy face -- they feel very nice and soft when dry but once wet I think the fibers clump together and turn into tiny needles or blades (somewhat of an exaggeration). I've had this Plisson for a week now and have yet to try it. I'm working through a box of synthetic brushes from a brush pass around. Thank you so much for your answer.Looking forward to read your reviews ! A custom brush from Bob @ Elite Razor with a Motherlode knot just joined the madness. This knot is something else, super dense, super soft cotton ball top. I'm swimming in synthetics now! It's going to be busy over the next couple months. My goal is to test various knots that are significantly different, not just minor variations of the Plissoft type that started it all. Things like Muhle STF v2, Motherlode, Tuxedo, evolution fiber Plisson and of course the original Plisson. Not convinced yet that synthetics will fully replace my badgers, but they may join in the fun. I like reading about the reviews as well on the different types of fibres. I believe it is more accurate to say that Muhle Silvertip Fibres started the synthetic craze as they had their product out before Plisson. I can't deny the impact Plisson had on the synthetic market, though. Probably it is best said that Muhle STF provided the fuel getting people ready for the idea that synthetics were a viable alternative, but Plisson provided the spark that lit the blaze cementing that synthetic brushes had their place in the marketplace and were here to stay. I've got a few that I enjoy to this day, but I'm waiting for the fibres to become more badger like. I know for me they won't replace badgers yet, but the idea of further improvements on synthetic hair intrigues on two fronts: wanting a closer experience to badger, and at the same time I appreciate the attributes synthetics already bring to the market with their unnatural softness, fast drying ability, and the relative cost. So regardless of wanting more more badger likeness, I'm just as apt to purchase any new synthetic to experience it for what it is in the here and now. (09-08-2018, 02:17 PM)kooshman7 Wrote: Probably it is best said that Muhle STF provided the fuel getting people ready for the idea that synthetics were a viable alternative, but Plisson provided the spark that lit the blaze cementing that synthetic brushes had their place in the marketplace and were here to stay. I'd love to see some synthetic fibers with curled tips, like some badgers tend to do with use. I remember I had a Shavemac where the hair tips looked like Js and it was oh so soft. For me some of these Plissoft type knots with thin fibers feel prickly when wet even though they are extremely soft when dry. Prickly not in the good scrubby way but more like tiny needles. And sometimes I'm left with a slightly itchy face. I suspect it's because the fibers clump together when wet. Thicker fibers don't seem to have the same effect. Quote: We are sincerely sorry but we do not ship to the United States. Looks like in the US, Fendrihan has some of the ivory and black LMDB brushes if anyone else is looking. Sorry, not a fan of synthetic shaving brushes. Synthetic fibers simply do not hold water. Yes they lather but they also throw that lather all around if any vigor is used. Should synthetic brushes end Badger brushes. I don't think so! Lather in your hand if you must. Use said hand----spread on face? Lots of alternatives out there. But For me, Badger hair is the best for any shaving brush. (09-26-2018, 01:26 PM)oldjoe Wrote: Sorry, not a fan of synthetic shaving brushes. Synthetic fibers simply do not hold water. Yes they lather but they also throw that lather all around if any vigor is used. Should synthetic brushes end Badger brushes. I don't think so! Lather in your hand if you must. Use said hand----spread on face? Lots of alternatives out there. But For me, Badger hair is the best for any shaving brush. I agree. Badger brushes are still my favourite type of brush hair BY FAR. And I own 14 Synthetic brushes, all top performing Synthetics, but compared to my badgers, they all fall short. (09-03-2018, 10:55 AM)SirWhiskers Wrote: Mind posting a pic of the Ferrari Red please? I was looking at it too. I'd like to see a pic closer to reality than the web renderings. Also, does anyone know whether LMDB (rasagetradition.fr) delivers to the US? Sent them an email but they are not responding. Wish I had this Ferrari Red color in the older type hair. Looking at their site it seems all they sell now is the new type. I’m a big fan of the older version..? 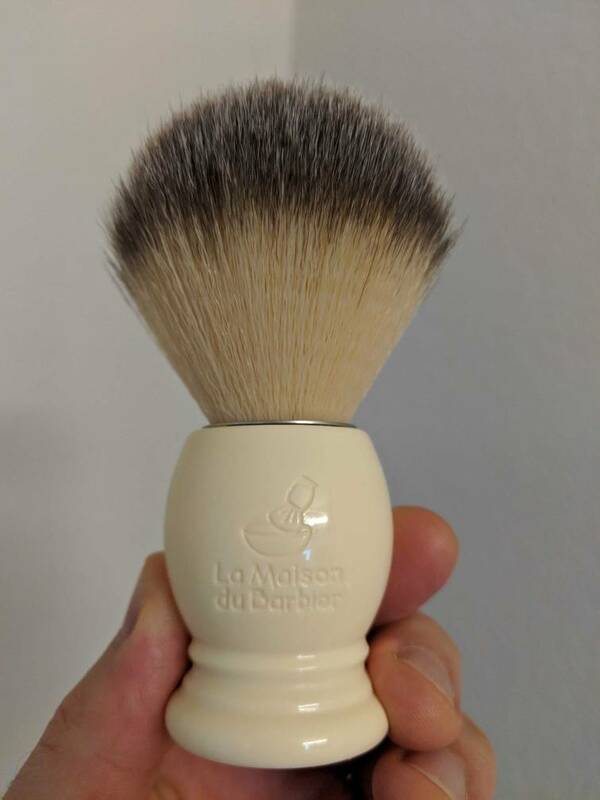 Sorry to resurrect a old thread, but I, too, was interested in the La Maison du Barbier synthetic shaving brush, and inquired if they shipped to the USA as it wasn't a listed choice. I was advised that they do indeed ship to the USA, although the shipping cost is obviously more than Europe (but no VAT tax). USA shipping has been added to the checkout screen. So, if you're in the USA or Europe and interested in ordering what is effectively the old L'Occitane shaving brush knot in a French acetate handle at a reasonable price, you now have an option. I have one that I hardly have used. I have that one Nero! Is the same fibres Plisson puts on their brushes and very nice.